Today felt like the warmest day of the year so far and I had an enjoyable bike ride out and about though it was overcast, damp and very windy. 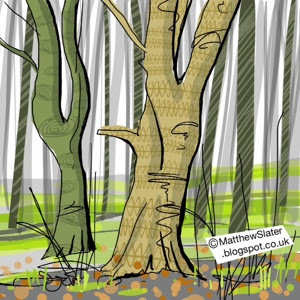 Scribbled these trees in drizzle - the iPad is fine in such conditions but it would have been impossible to use my sketchpad. It isn't a brilliant sketch but I was playing with patterns and exploring how I can use and incorporate them into my iPad illustrations when drawing from life. I rather rushed it because I was beginning to get a bit chilly. 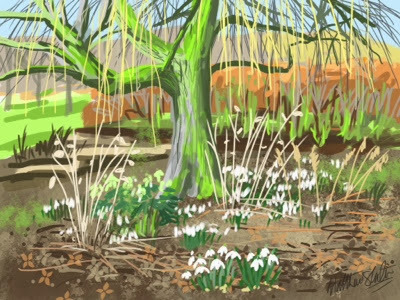 I have been exploring more with my acrylic paints but after working for so long digitally I am finding that traditional painting is sooooo slow and not yet giving me a sense of life and playfulness that I get with iPad work. Will continue to experiment.